Tag line: "In the Dark Ages, Magic was a weapon. Love was a mystery. 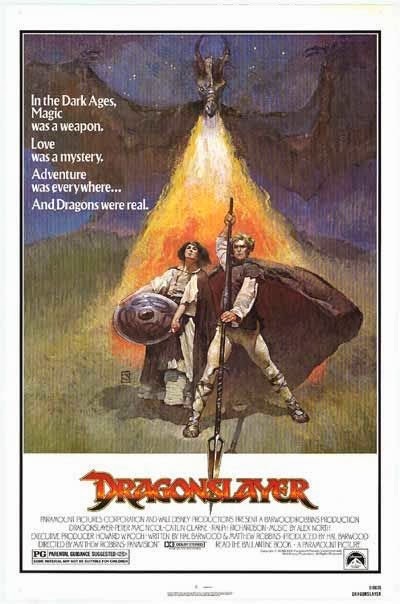 Adventure was everywhere... And Dragons were real"
With its tale of wizards, knights, and a fire-breathing dragon, director Matthew Robbins' 1981 movie Dragonslayer is still a hell of a lot of fun. For years, the kingdom of Urland has lived in fear of a terrible dragon, which they’ve managed to keep at bay by offering it the occasional human sacrifice (one of the village's young women, chosen by special lottery). Hoping to finally rid themselves of the creature, a delegation from Urland, led by Valerian (Caitlin Clarke), pays a visit to Ulrich (Sir Ralph Richardson), a wizard powerful enough to defeat the dragon once and for all. But when Ulrich is struck down by Tyrian (John Hallam), who serves King Casiodorus Rex (Peter Eyre), the task instead falls to Ulrich’s apprentice, Galen (Peter MacNicol), who, despite his lack of experience, is Urland’s only hope of restoring peace to the land. Dragonslayer has all the makings of a fine fantasy film, giving us not one, but two wizards, each capable of performing amazing feats. Ralph Richardson is effective as the aged Ulrich, and MacNicol is equally good as Galen, the brash newcomer who’s in way over his head (Galen can conjure up simple parlor tricks, yet his attempt to trap the dragon inside its cave doesn’t end well). Along with its dual wizards, Dragonslayer features the drama of a Lottery, which Urland uses to select the next young lady who'll be sacrificed to the dragon (in a key scene, Princess Elspeth, played by Chloe Salaman, takes matters into her own hands when she learns her father the King has kept her name out of the lottery). And keep an eye out for Ian McDiarmid, aka the Emperor in the Star Wars saga, who appears briefly as a holy man. Of course, what makes Dragonslayer so entertaining is the dragon itself, brought to life by (among others) renowned special effects gurus Dennis Muren and Phil Tippett, both of whom contributed their talents to the original Star Wars trilogy. While some of the visual effects don’t look as realistic today as they did in 1981 (especially when the dragon is in flight), a later sequence, where the creature rises out of the water to attack Galen, is still pretty damn impressive. At one point, we’re even treated to some baby dragons, which appear in a particularly gruesome scene. Dragonslayer is, at all times, a good fantasy film, but the dragon makes it an even better one. This movie is excellent in every way. Cast. Direction. Cinematography. FX. Art design. Etc. This is also the film that famously made Ray Harryhausen retire. Over Go-Motion. Even though they used a stop-motion figure for the dragon, they enhanced it with inter-frame blurring. The FX guys gave Harryhausen a preview and he knew then that his days were done--that computers were going to do it all and that his days as an artisan were over. I love this film. I can't really find anything at all to criticize when it comes to this movie. It's almost perfect. As such, I should hold it in higher esteem, but for some reason I don't list it among my favorite films. Perhaps there is something subconsciously bugging me about it that I'll have to find on a future viewing. Or maybe I'm just a critical curmudgeon.